Messages from H. C. to return Wrayford's Bill, Andrews's Bill, and Cowslade's Bill. Lords insist on their Amendments. Message to them, with another Amendment to it. Protestant Heirs, Papists not to disinherit, Bill. No Privilege against proving Wills. Ward and Levett versus E. of Meath, Judgement. Appeal to the Irish House of Lords, coram non Judice. Halpence, &c. to prevent the coining of, Bill, rejected. Paper, &c. Duties on, Bill. Admiralty Answer to Seamen's Pet. Epus. Cicestr. Dux Leeds, Præses. Hodie 2a vice lecta est Billa, intituled, "An Act for the better apprehending, prosecuting, and punishing of Felons, that commit Burglary, Housebreaking, or Robbery, in Shops, Ware-houses, Coach-houses, or Stables, or that steal Horses." ORDERED, That the said Bill be committed to a Committee of the whole House; on Monday next, the first Business. To desire a Conference, upon the Subject-matter of the Lords Amendments made to the Bill, intituled, "An Act for naturalizing Richard Legg and others." Then the Commons were called in; and told, "That the Lords agree to a Conference, as desired; and appoint it presently, in the Painted Chamber." To return the Bill, intituled, "An Act to enable William Wrayford Gentleman and Dame Anne Rich Widow to make Leases of Houses and Ground in Covent Garden, late the Estate of John Athy Citizen and Haberdasher of London;" to which they have agreed, with some Amendments, whereunto they desire the Concurrence of this House. Which, being read Thrice, were agreed to; and ORDERED, That the Commons have Notice thereof. 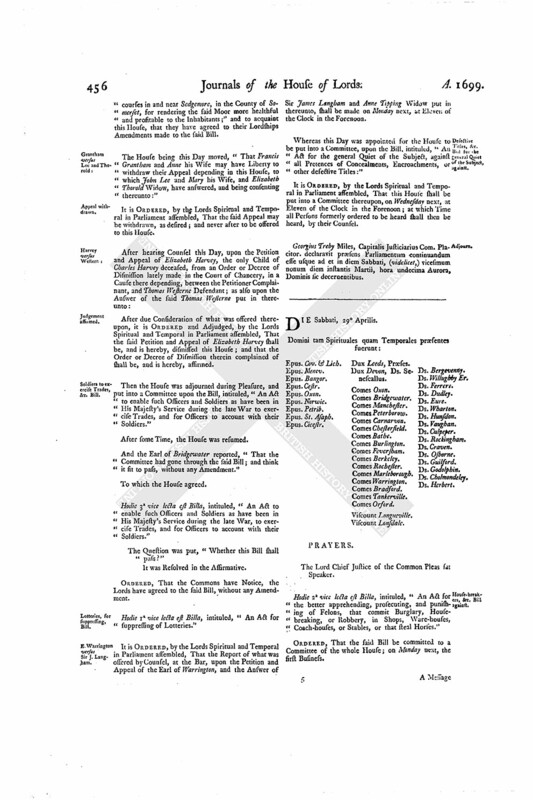 To return the Bill, intituled, "An Act for Sale of the Manor of Downham, in the County of Essex (the Estate of Sir Francis Andrews); and for buying and settling other Lands to the same Uses;" and to acquaint this House, that they have agreed to their Lordships Amendments made to the said Bill. To return the Bill, intituled, "An Act for selling divers Freehold and Leasehold Houses, the Estate of Thomas Cowslade, an Infant, and others, to discharge a Mortgage; and to purchase other Lands, to be settled to the like Uses;" to which they have agreed, without any Amendment. The Commons being come to the Conference; the House was adjourned during Pleasure, and the Lords went to the Conference. And the Earl of Rochester reported, "That the Commons do not agree to the Lords Amendments made to the Bill, intituled, An Act for naturalizing Richard Legg and others;" and gave their Reasons for it. The House agreed, to insist on their Amendments made to the said Bill; and that the Committee to whom the Consideration thereof was referred do prepare Reasons, to be offered at a Conference, for their Lordships insisting on their Amendments. To return the Bill, intituled, "An Act for naturalizing Samuel Bernardeau, Peter Chantree des Gaudree, and others, Private Gentlemen belonging to His Majesty's Three Troops of Guards and Grenadiers;" to which the Commons have agreed, with an Amendment, by adding One Name. To return the said Bill; and acquaint them, that the Lords have agreed to their Amendment made to the said Bill, with an Amendment, to which they desire their Concurrence. Hodie 2a vice lecta est Billa, intituled, "An Act to discharge the Ships King William and Charles the Second from the Penalties of the Act of Navigation." Hodie 3a vice lecta est Billa, intituled, "An Act to discharge the Ships King William and Charles the Second from the Penalties of the Act of Navigation." Hodie 2a vice lecta est Billa, intituled, "An Act to prevent Settlements made by Papists from dismheriting their Protestant Heirs." ORDERED, That the said Bill be committed to a Committee of the whole House; on Monday next, at Eleven of the Clock, the First Business. 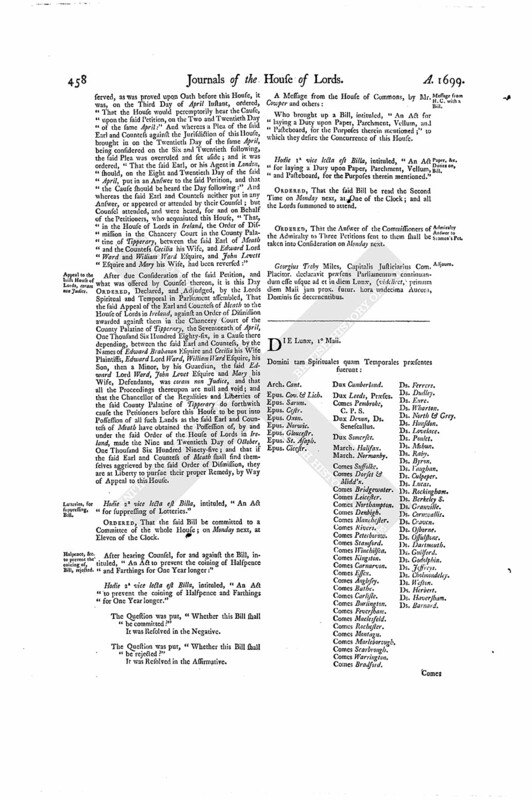 Upon reading the Petition of the Right Honourable John Earl of Bridgewater, Sir Charles Windham Knight, and Richard Robinson Esquire; praying, "That they may be at Liberty to prove the Will of the late Duke of Bolton:"
It is Resolved and Declared, by the Lords Spiritual and Temporal in Parliament assembled, That no Peer or Lord of this House, hath Privilege, whereby any Stop or Hinderance may or can be given to the proving the Will of any Person whatsoever; and that this Order be added to the Roll of Standing Orders of this House. 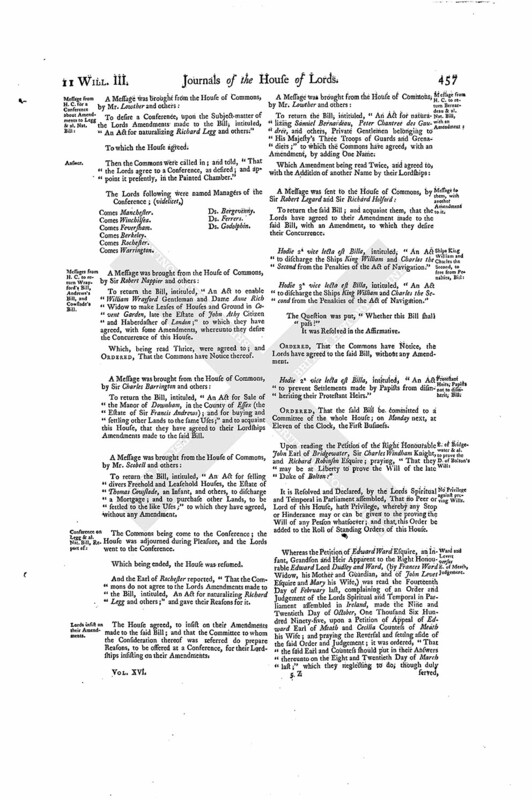 Whereas the Petition of Edward Ward Esquire, an Infant, Grandson and Heir Apparent to the Right Honourable Edward Lord Dudley and Ward, (by Frances Ward Widow, his Mother and Guardian, and of John Levet Esquire and Mary his Wife,) was read the Fourteenth Day of February last, complaining of an Order and Judgement of the Lords Spiritual and Temporal in Parliament assembled in Ireland, made the Nine and Twentieth Day of October, One Thousand Six Hundred Ninety-five, upon a Petition of Appeal of Edward Earl of Meath and Cecilia Countess of Meath his Wife; and praying the Reversal and setting aside of the said Order and Judgement; it was ordered, "That the said Earl and Countess should put in their Answers thereunto on the Eight and Twentieth Day of March last;" which they neglecting to do, though duly served, as was proved upon Oath before this House, it was, on the Third Day of April Instant, ordered, "That the House would peremptorily hear the Cause, upon the said Petition, on the Two and Twentieth Day of the same April:" And whereas a Plea of the said Earl and Countess against the Jurisdiction of this House, brought in on the Twentieth Day of the same April, being considered on the Six and Twentieth following, the said Plea was overruled and set aside; and it was ordered, "That the said Earl, or his Agent in London, should, on the Eight and Twentieth Day of the said April, put in an Answer to the said Petition, and that the Cause should be heard the Day following:" And whereas the said Earl and Countess neither put in any Answer, or appeared or attended by their Counsel; but Counsel attended, and were heard, for and on Behalf of the Petitioners, who acquainted this House, "That, in the House of Lords in Ireland, the Order of Dismission in the Chancery Court in the County Palatine of Tipperary, between the said Earl of Meath and the Countess Cecilia his Wife, and Edward Lord Ward and William Ward Esquire, and John Levett Esquire and Mary his Wife, had been reversed:"
After due Consideration of the said Petition, and what was offered by Counsel thereon, it is this Day ORDERED, Declared, and Adjudged, by the Lords Spiritual and Temporal in Parliament assembled, That the said Appeal of the Earl and Countess of Meath to the House of Lords in Ireland, against an Order of Dismission awarded against them in the Chancery Court of the County Palatine of Tipperary, the Seventeenth of April, One Thousand Six Hundred Eighty-six, in a Cause there depending, between the said Earl and Countess, by the Names of Edward Brabazon Esquire and Cecilia his Wife Plaintiffs, Edward Lord Ward, William Ward Esquire, his Son, then a Minor, by his Guardian, the said Edward Lord Ward, John Levet Esquire and Mary his Wife, Defendants, was coram non Judice, and that all the Proceedings thereupon are null and void; and that the Chancellor of the Regalities and Liberties of the said County Palatine of Tipperary do forthwith cause the Petitioners before this House to be put into Possession of all such Lands as the said Earl and Countess of Meath have obtained the Possession of, by and under the said Order of the House of Lords in Ireland, made the Nine and Twentieth Day of October, One Thousand Six Hundred Ninety-five; and that if the said Earl and Countess of Meath shall find themselves aggrieved by the said Order of Dismission, they are at Liberty to pursue their proper Remedy, by Way of Appeal to this House. Hodie 2a vice lecta est Billa, intituled, "An Act for suppressing of Lotteries." ORDERED, That the said Bill be committed to a Committee of the whole House; on Monday next, at Eleven of the Clock. After hearing Counsel, for and against the Bill, intituled, "An Act to prevent the coining of Halfpence and Farthings for One Year longer:"
Hodie 2a vice lecta est Billa, intituled, "An Act to prevent the coining of Halfpence and Farthings for One Year longer." The Question was put, "Whether this Bill shall be rejected?" Who brought up a Bill, intituled, "An Act for laying a Duty upon Paper, Parchment, Vellum, and Pasteboard, for the Purposes therein mentioned;" to which they desire the Concurrence of this House. Hodie 1a vice lecta est Billa, intituled, "An Act for laying a Duty upon Paper, Parchment, Vellum, and Pasteboard, for the Purposes therein mentioned." ORDERED, That the said Bill be read the Second Time on Monday next, at One of the Clock; and all the Lords summoned to attend. ORDERED, That the Answer of the Commissioners of the Admiralty to Three Petitions sent to them shall be taken into Consideration on Monday next. Georgius Treby Miles, Capitalis Justiciarius Com. Placitor. declaravit præsens Parliamentum continuandum esse usque ad et in diem Lunæ, (videlicet,) primum diem Maii jam prox. futur. hora undecima Aurora, Dominis sic decernentibus.